Before shooters took over the gaming scene, Bomberman was the premiere multiplayer gaming franchise. Though the series was known mostly for its competitive multiplayer, some of the best entries in the series – especially Saturn Bomberman – featured local co-op as well. After letting the series lie dormant for too long, Konami has finally revived the franchise with Super Bomberman R. The former Switch exclusive now resides on Xbox One, PlayStation 4, and Steam as well, bringing 2-player local co-op plus the local and online multiplayer that fans crave. 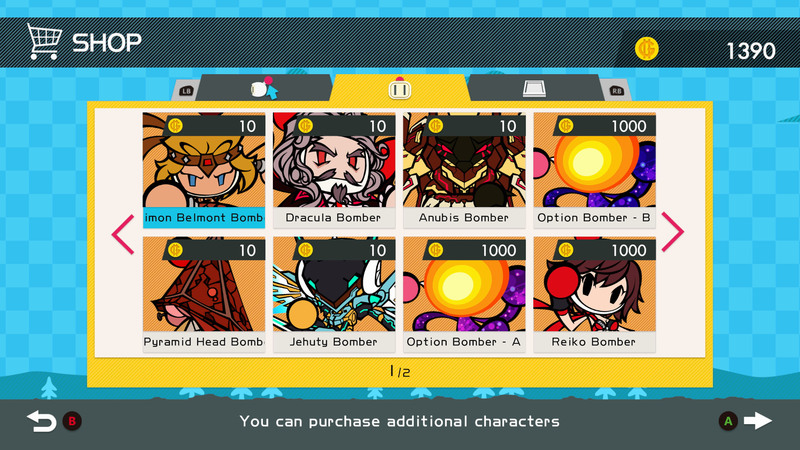 Super Bomberman R’s story mode consists of six distinct planets, each with eight levels and two challenging boss fights. The story is surprisingly cinematic, with multiple animated and fully voiced cutscenes per planet. The basic premise is that the evil Buggler Army has revived the five Dastardly Bombers in order to take over the universe, and only the eight Bomberman Rangers (each color-coded and with a humorous personality trait). The English voices are a bit too hammy (and wildly different from traditional series voices), but at least they make each colored Bomberman truly distinct from the others. The gameplay will be instantly familiar to series fans. Our heroes start with no power-ups and must use their bombs to destroy soft blocks and enemies, hopefully finding useful items in the process. 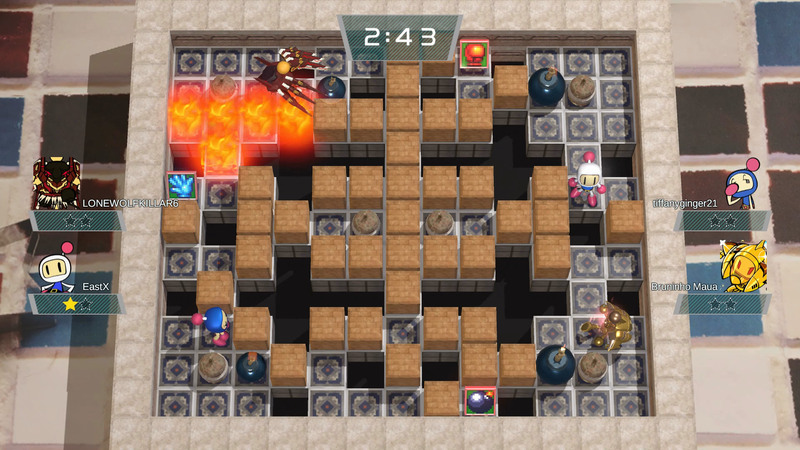 Players can walk diagonally, but it rarely comes into play because most levels adhere to the traditional grid-structure that characterizes mainline Bomberman games. Throwing bombs is a bit iffy because the throw distance is too far, and bombs can also land on top of structures when you’d want them to bounce over. Oddly, bombs are laid with the B button on Xbox/Circle on PlayStation, and (for no discernible reason) this can’t be changed. 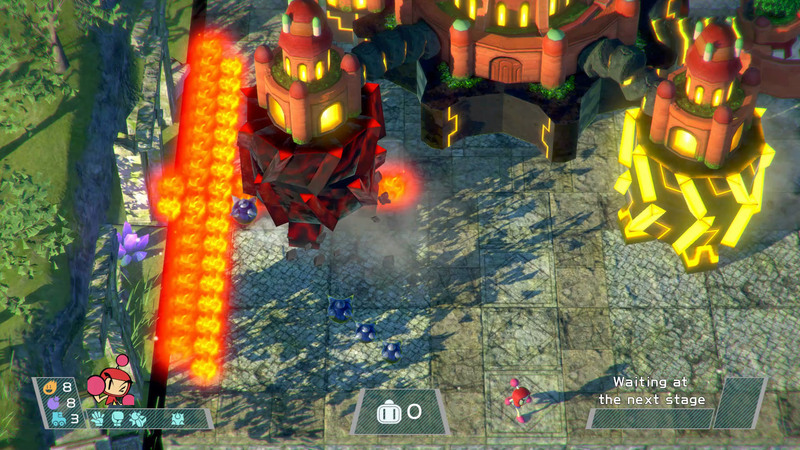 But other than these quirks (which you get used to), it feels like a proper Konami/Hudson-developed Bomberman game. Your enjoyment of story mode will be affected by your camera setting. The default view tilts the playfield at a strange obtuse angle that nobody could possibly find intuitive. But the shoulder buttons will toggle between a couple of other angles, with “front” being the normal right angle that suits this series best. The camera can thankfully be set to “front” in the settings and never worried about again. If the second player doesn’t join in before starting a world, they can still join in during the world itself. The only catch is the second player won’t appear until the current level is completed. So if you wanted help on a boss, you’d need to have the player join before reaching that boss. It’s a needless restriction, but most levels are short enough to minimize the inconvenience. Just as in Saturn Bomberman, bringing a friend along for story mode doesn’t automatically make the game easier. Each player’s bombs can destroy either player, and you tend to lay a lot of bombs while working through a level. The necessary risk associated with using your bombs has always been a hallmark of the series, after all. So the team needs to watch out for each other and perhaps even coordinate movements to minimize friendly fire. Both players share a pool of five lives per world, with no way to earn extra lives. If one person burns through the team’s lives, everybody suffers. You can continue from the current level rather than starting from the beginning of the world, but that costs gold. Gold is earned by completing levels or winning multiplayer matches. It’s also used to unlock extra characters and multiplayer stages, so you might want to think twice before continuing too often. Other than continues costing gold, the only real annoyance of story mode comes from some of the boss fights. Each world ends in a battle against a gigantic and impressive boss, which should be a highlight. But the camera can’t always keep up with the demands of the battle. It often pans too slowly and sometimes obscures your position relative to the boss. Particularly against the second boss, I lost too many lives from running into the boss because I couldn’t determine our positions well enough. 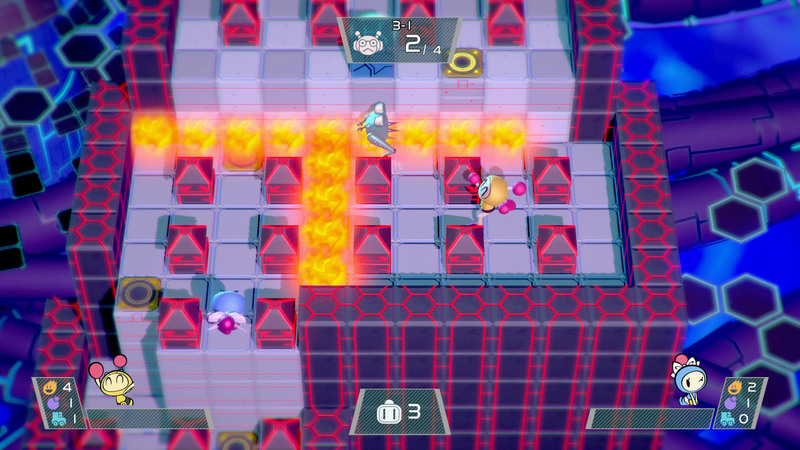 While it’s great to have a full co-op Bomberman campaign again, many players (including me!) buy these games for the competitive multiplayer. Super Bomberman R offers two competitive modes: Standard and Grand Prix. Both can be played locally or online, and two local players can even join online games. Standard adheres to normal Bomberman rules (last person standing wins) and maxes out at eight players. Grand Prix multiplayer is team-based, allows some customization of character abilities, adds a couple of win-condition variations, and maxes out at six players. Both multiplayer game types offer the option of playing against bots co-op style, but only offline. It’s a shame that Super Bomberman R doesn’t support online co-op (at least against bots, if not story mode). Adding bots to online matches would make things even more hectic and fun. Other online issues include a lack of leaderboards for ranked multiplayer, the inability to sit in a ranked room for as long as it takes for another person to join (it gives up and kicks you to the menu after a few minutes), and public unranked games annoyingly autostarting after twenty seconds. Super Bomberman R isn’t the best entry in the series, but it’s far from the worst. After the Bomberman Live games ditched story modes entirely (and Act Zero heinously excluded local multiplayer), it’s great to have another full co-op campaign here. 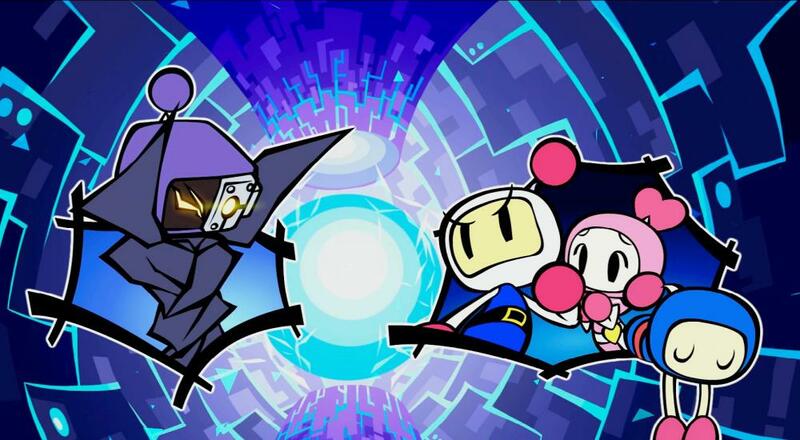 Friendships and romances will be tested by Bomberman’s unique need to work around each other in co-op, just as it was meant to be. If enough cooperative-loving gamers pick this one up, perhaps the competitive online mode won’t be such a ghost town. And if you have a few local friends to compete with after finishing story mode, you’re guaranteed to have a blast. The Co-Optimus Co-Op Review of Super Bomberman R is based on the Xbox One version of the game. A code was provided by the developer for review purposes. Additionally, the max number of supported players varies by platform, so please check the respective game page for the version in which you're interested to get more information about the co-op. The Co-Op Experience: Two Bombers can team up locally to tackle the game's story mode campaign. Both players share lives and must work together to avoid deaths from friendly fire. Players can also form a team and battle against A.I. bots in the offline "Battle Mode." The mode supports up to 8 players total (either humans or bots), and teams can be formed out of those 8. One Switch supports up to 4 players total via couch co-op. For the Nintendo Switch only, WAN play is supported using up to 4 Nintendo Switches. Multiple players can play on one Switch and connect via WAN, thus the maximum number for "Combo Co-Op" is 7 (e.g., 3 players on one Switch, 4 on another, or 2 players each on 3 Switches and 1 player on their own Switch). Finally, the multiplayer "Grand Prix" mode also allows offline co-op against teams of A.I. controlled bots. This mode supports up to 6 players (humans or bots) total. Page created in 1.0371 seconds.